Mediafootprint » How is Your Business Handshake? How is Your Business Handshake? Have you ever shaken someone’s hand and the grip was so powerful that you thought your bones were going to break? Perhaps it felt so pathetic that their hand was going to fall off? Handshakes are used everyday in the business world, but not all handshakes are professional. You won’t have a second chance at a first impression, so take the time to cultivate your professional handshake. Handshakes are used in greetings, meetings, job interviews, offering congratulations, closing a business deal and other encounters. It is a sign of trust and helps you build a strong relationship. A professional handshake must be firm. As you approach someone, extend your right arm when you are about three feet from each other. Your palm should be vertical to the ground and extended for their reach. Stand up straight, step or lean forward, make eye contact and smile or have a pleasant face. This sends a message of greetings as equals. It also communicates self-confidence and sincerity. There are many different types of handshakes. If you know the differences between the handshakes, you will be able to learn the hidden messages. Here are a few examples: the bone crusher, controller, the brush off, the politician, the finger vice, the dead fish, the sweaty palms, the lobster claw, the hand wrestler and the teacup. Bone Crusher. Your hand is squeezed until you cringe. This usually means that they could intimidate and try to overpower you. Controller. Your hand feels like it is being pulled toward the person or a different direction. This usually means that they want to dominate and control. Brush Off. This is a quick grasp and release. This usually means that their ideas and viewpoints come first and foremost. Politician. Your hand is firmly grasped as a normal handshake. This usually means to be cautious and alert. Finger Vice. The other person only grabs your fingers and not your entire hand. This usually means that they are insecure. Dead Fish. It feels like the person has no bones in their hand. This handshake usually means that they convey no power and are generally not people-focused. Sweaty Palms. It is self-explanatory and usually means that they are nervous. Lobster Claw. The other person’s thumb and fingers touch the palm of your hand. This usually means that they fear connecting at a deep level and it will take time to build a relationship. Hand Wrestler. Your hand is twister under the other person’s hand. This usually means that they want to prove something. Teacup. This handshake is formed like a teacup since the palms do not make contact. This usually means that the person is hiding something or very shy. 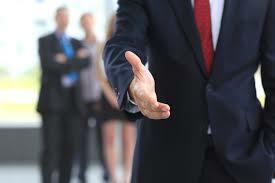 A handshake is a learned behavior so it is important to take the time and create the right business etiquette. Regardless what you think, people will judge you by your handshake.